While only a handful of voters met last Friday for Windham’s first Green Party caucus, it was nevertheless an historic occasion with gubernatorial candidate Pat LaMarche discussing her campaign for Governor and the opportunity Greens have to take a stand in local politics this November. LaMarche, a former journalist, educator and talk show host for WGAN, earned her place in U.S. history as vice presidential candidate in 2004 when she ran alongside Green presidential candidate David Cobb. During their campaign, LaMarche and Cobb slept in homeless shelters across the nation to bring attention to poverty and helped support local Green legislative candidates in various cities and towns. They would later contest the 2004 ballot count in Ohio where complaints of discarded ballots, broken voting machines and problems with polling locations brought President Bush’s victory in that state under scrutiny. 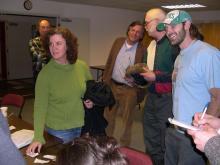 Upon entering the Windham Public Library where the caucus was held last Friday night, several young Greens greeted LaMarche with bright, hopeful eyes. In the background was Windham’s John Coffee, caucus organizer and a longtime political activist who began working for the Democratic Party back in the 1950s. He later left the party during the 1990s after becoming “disenchanted” with the behind-the-scenes politics surrounding the party. Libby Topel, an old high school friend of LaMarche, surprised her at caucus. The two hugged and chatted before LaMarche sat down at the caucus table to address the eager Greens. Topel, a Windham resident who prescribes to no specific party but tends to vote Republican, listened in on their discussions. “There’s a lot of people running and I want to know what everybody’s thinking,” she said. The Greens criticized the state of affairs in mainstream politics and asked LaMarche questions about her campaign, views and past experiences. LaMarche commented on how the major parties had lost touch with average Mainers. The “Maine” issue in her mind is “jobs, jobs, jobs,” she told the caucus, and talked of the loss of whole industries that once supported Maine families. She spoke of keeping Maine’s young people in the state, taking care of the senior citizens and the possibility of a universal healthcare system for all Maine residents. She also took aim at partisan politics and advocated that Democrats and Republicans not try and “re-invent the wheel,” but rather look at all ideas openly in terms of would be best for Maine. A former businesswoman, LaMarche talked about the difficult climate for small businesses to succeed in Maine. “Why are we not supporting small business?” LaMarche asked. She pointed out that millions of dollars had been appropriated to support small business, but instead were spent to draw corporations like Wal-Mart to the state. LaMarche warned her fellow Greens that the major parties would attempt to “marginalize” any third party candidate in fear of losing valuable votes. Maine has more Green voters per capita than any other state in the nation. In Windham, the number of registered Greens has risen from 80 to 237 in a few years and without any grassroots initiative or formalized local party. The Green Independent Party is the only international political party with members in most Western European countries and parts of Africa. This time around, LaMarche is running for Governor as a Clean Election candidate. That means she cannot receive more than $100 from any single person, company, or organization. Instead, LaMarche must collect 2,500 five-dollar donations to be eligible for campaign financing through the Clean Election fund. This “allows candidates to be only beholden to the people,” she said, and not the lobbyists in Augusta. During her 1998 run for governor, she spent only $20,000 on a grassroots campaign and garnered 7 percent of the vote.